Hardwood flooring is an extremely desirable decorating feature and has risen in popularity over the past several years. They can beautify any living space and provide years of low maintenance as an added benefit. They are recommended for allergy sufferers because carpeting harbors allergens in the matting and padding. More homeowners are deciding to use hardwood flooring in their basements despite the risks of damage from the water vapor that may not be apparent until sometime later. Wood floors may warp in time as water vapor evaporates from the groundwater in the soil beneath the concrete slab. Immediate damage can result from flooding, drain backups, broken water pipes or a wall leak. Replacement can be very costly and time-consuming. Many waterproofing professionals, foundation repair specialists, basement finishing experts, and carpenters will refrain from recommending hardwood or parquet flooring or wooden subfloors in the basement. Homeowners need to be aware of the potential problems, insurance coverage, time, and replacement costs inherent with hardwood floors. Precautions can be taken to minimize damage risks, but there are no guarantees that this type of flooring will remain dry. The section on Basement Flooring provides more thorough details. Hardwood floors provide a warming atmosphere and an attractive flooring in any part of the home, including the basement. Laminate is offered in a variety of wood grains, vinyl, and tile patterns. The core of the product consists of High Density Fiber or HDF. The top layer is replicated to appear as a photographic image of the chosen texture. The tiles and floorboard can be installed in the following methods: float, tongue-and-groove, and an interlocking or locking system. 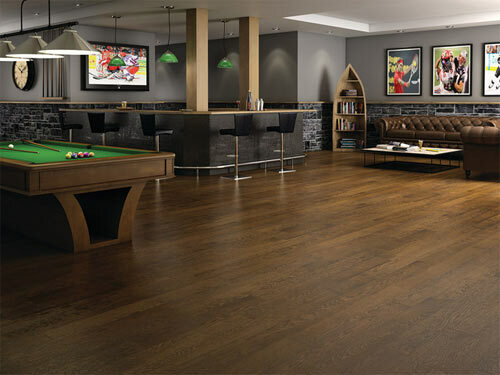 As a basement flooring choice, laminate is usually considered to have the advantage with solid hardwood. The HDFs in the laminate are very resistant to damage from moisture and a number of other adverse conditions. Solid hardwood is offered in natural wood species throughout the entire core of the product. Tongue-and-groove installation is the generally prevalent method. Sanding and refinishing can take care of any imperfections or warping for laminate floors, but the results are superior on hardwood floors. While engineered hardwood flooring has advantages compared to solid hardwood in basement floor applications, engineered hardwood is a newer technology that may make hardwood flooring in basements a standard choice. Because the water temperatures in radiant floor heating systems can negatively affect wood or adhesives used in installation, laminate is usually the most highly-recommended option for its hardwood appearance and durability. If the homeowner is insistent on hardwood flooring, engineered hardwood is a great choice. Many of the damage risks can be minimized because of the core components of the materials and the applied engineering. Please consult with the appropriate professionals when considering this option: foundation repair specialists, waterproofing contractors, basement refinishing experts, and the flooring manufacturer of your choice. The vulnerabilities of solid hardwood include moisture and heat. Repeated exposure to these conditions can cause warping, cupping, swelling, and splitting. Engineered hardwood consists of a combined core of hardwood, plywood, or HDF with a veneer of hardwood glued to the top of the core surface. As opposed to the laminates with their photographic layer, the veneer of engineered hardwood contains the natural characteristics of almost any hardwood species. Typically, three or more core layers are laminated together under a high pressure bonding process to provide greater stability. This process ensures minimal damage risks, especially where moisture and heat are prevalent threats. The core layers and veneer are constructed in this multiple-ply planking technique to effectively counteract any warping, cupping, swelling, or splitting. Engineered hardwood flooring is a better choice for use over radiant heated concrete slabs, above or below grade subfloors, and in rainy climates. The hardwood veneer on the top layer of engineered hardwood flooring can range in thickness. Generally, recommendations are to choose at least a 2mm thickness or more. The most common thicknesses chosen range between .6mm and 4.5mm. Thicker veneers are available. The thickness selection can be affected by the expected frequency of use, budget, or characteristics of the wood veneer. The Janka Hardness Rating can assist homeowners in selecting the option best-suited for for their purposes and value. Red Oak is considered a benchmark comparison at 1290. Because of its popularity, most homeowners are familiar with the natural characteristics. As durability is the key selling feature for most consumers, being familiar with the Janka Hardness Ratings will assist communication with an engineered hardwood consultant or hardwood consultant. For your personal use, the chart below is provided. If the homeowner is involved in the building process, the basement concrete slab can be poured taking the basement flooring choice into consideration. A request should be made for porous backfill (gravel) to be used in the aggregate bed. This porous backfill allows for better drainage of groundwater that can either be directed underground away from the home or into a sump pump basin. Another example is that a hydronic basement floor radiant system will require flexible tubing to be looped and tied in place prior to pouring the slab. Especially because of the wood core content of the flooring, proper subfloor preparation is essential to the durability of the finished hardwood floor. More detailed information on the importance of a suitable water vapor barrier can be found in the section on Basement Flooring. The maximum level variance on the subfloor should not be greater than ¼ inch over and 8' span. The recommendations of your chosen manufacturer should always be followed, as non-compliance can result in voiding of the warranty. Depending upon the project budget, the engineered basement hardwood flooring can be installed in one of two manners. Because of the concrete slab, nailing is not possible. Hardwood floors, including their engineered alternatives, add beauty to any floor . Floating the flooring over the concrete slab is the most popular method. However, the flooring can also be glued to the substrate. If using a basement radiant heating system, the recommendation is to refrain from the gluing method. The constant heat from the flexible tubing can damage the adhesives. Because wood is susceptible to damage from moisture, it is important that the heating and air conditioning systems be operational at the time of installation. During the cooler seasons, the furnace aids in drying out the cement slab. In the warmer months, the air conditioner reduces moisture and humidity in the basement. Although the risks of eliminating the potential for water infiltration remains, the latest engineering is widening the choices for beautiful basement flooring. If homeowners do their research and take proper damage preventive measures, they can enjoy the classic design elements and easy maintenance of hardwood flooring. Hardwood flooring is no longer designated to just the main living area spaces! Tip #13. What advantages do CFRPs offer in repairing cracked and bowed basement walls? CFRPs cut overall time and costs to both the contractor and homeowner because traditional repair methods often require extensive exterior repairs. CFRPs can be applied and camouflaged directly on the interior wall. CFRPs cannot reverse damage from cracked and bowed walls, but the locked-in durability arrests any further stretch, creep, or bend often seen in traditional materials.